In our recent Job Seeker Webinar, “Getting Your Foot in the Door,” Advanced Resources presented 8 tips for job search success. One of those tips, of course, was working with a staffing firm or recruiter as part of your overall search strategy. According to the American Staffing Association, more than three million temporary and contract employees work for America’s staffing companies during an average week. During the course of a year, America’s staffing companies hire 11 million temporary and contract employees. This number grows still when you add on the millions of people who work with recruiters to find direct hire or “permanent” positions. Despite these large numbers, job seekers can still be unclear on what they should expect when they’re working with a staffing agency or recruiter. This uncertainly can create false expectations and often, frustration. That’s why we really love the infographic that was created by Advanced Resources’ sister company, The WunderLand Group. 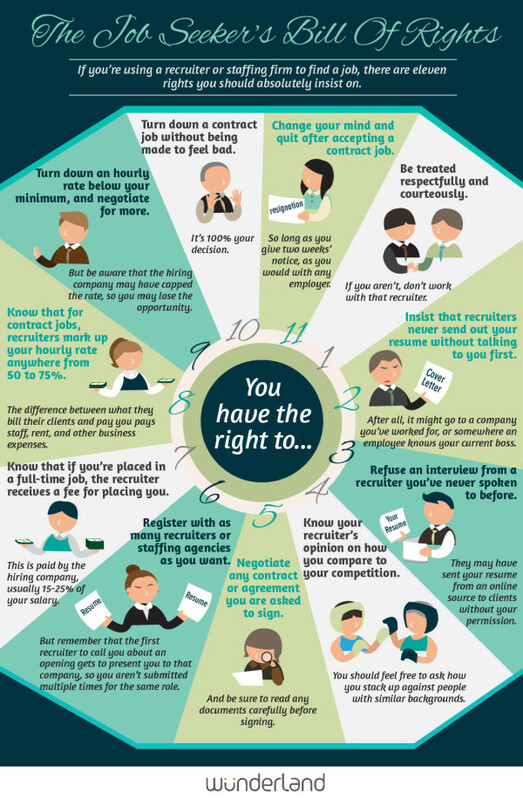 The infographic illustrates “The Job Seeker’s Bill of Rights,” 11 things that every job seeker should expect when working with a staffing agency.